The Philadelphia Flyers were one of the worst teams at penalty killing last season. They were ranked 29th in the NHL and only killed 75.8% of penalties. If they want to make it back to the postseason, the penalty kill is going to have to be a lot better. Since assistant coach, Ian Laperriere was named as part of the coaching staff, the Flyers’ penalty kill has been a disaster. He is currently in charge of the penalty kill and has been for the past few seasons. The amount of penalties taken has decreased, but the amount of goals given up is still too high. In the past four seasons, the Flyers have given up a total of 216 power play goals and have allowed 50 or more in four consecutive seasons. 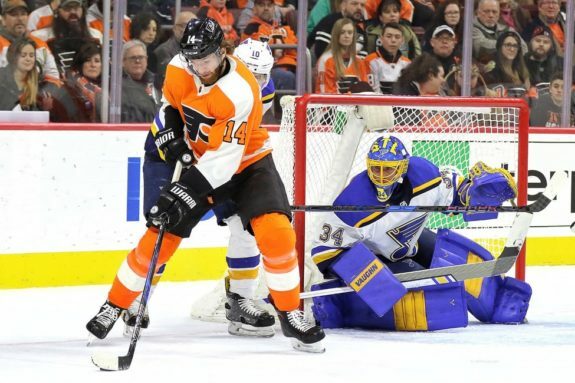 The Flyers have been ranked 20th or worse in the each of the last four seasons and something has to give, whether it’s the coach or players changing roles. Their lack of success could be due to the scheme, the personnel or a combination of the two. The goaltenders also need to step up and make some key saves to bail out the team every once in a while. The last time the penalty kill was ranked in the top 10 was in the 2013-14 season when they finished as the seventh-best penalty killing team. The preseason is meant to improve on areas of weakness. The Flyers took some penalties and the penalty kill looked basically the same as last season. In eight games, the penalty kill was only perfect in three including only one penalty against the New York Islanders. They were shorthanded 38 times and allowed eight power-play goals against, meaning they only killed off 78.9%. The team has got to find a way to improve this season, or they could be on the outside looking in come the postseason. The penalty kill did not look good at the start of the preseason. Because of roster changes and veteran players out with injuries, there were some new faces on the penalty kill. Laperriere leads the penalty kill unit again this season, but it could be his last if they don’t make improvements. 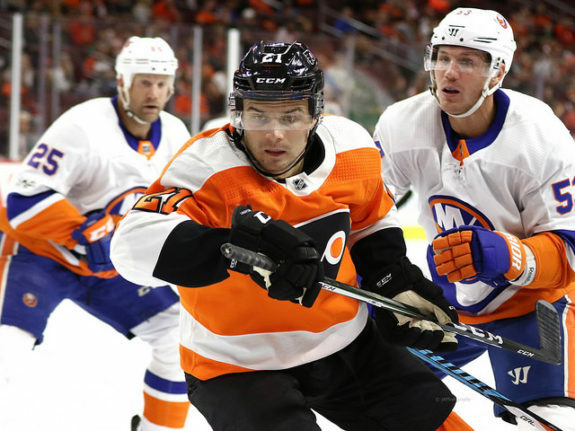 The duo of Corban Knight and Scott Laughton saw some time together until Knight suffered an injury and is now on injured reserve. What’s Wrong With the Flyers’ Penalty Kill? The biggest thing that keeps the penalty kill from succeeding is the lack of aggression. The Flyers let the opposition move right through the neutral zone and into their zone. Once there, the Flyers stand around or fall into a box waving their sticks on the ice trying to disrupt the shooting and passing lanes. The team also tends not to clear the puck under pressure, allowing the opposition to get set up for extended pressure. The Flyers need to avoid trying to clear the puck up the middle of the ice since they fail more times than not. 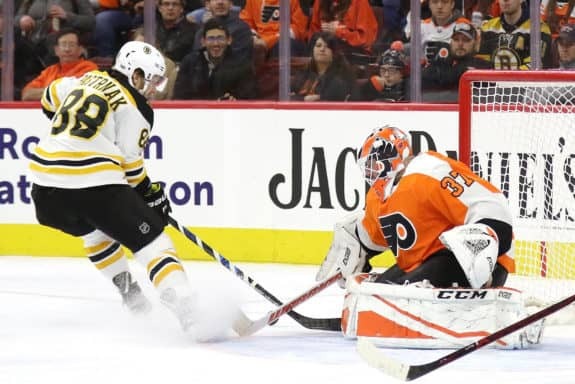 The net-front presence on the opposing team’s power play is usually left untouched, so he can get rebounds or get his stick on the puck to deflect it past the goalie. The Flyers are not winning board battles and are beat to loose pucks. Also, the goalies have been another big problem because when called upon to save the team’s bacon, they have failed to do so. One option would be to switch up the players. 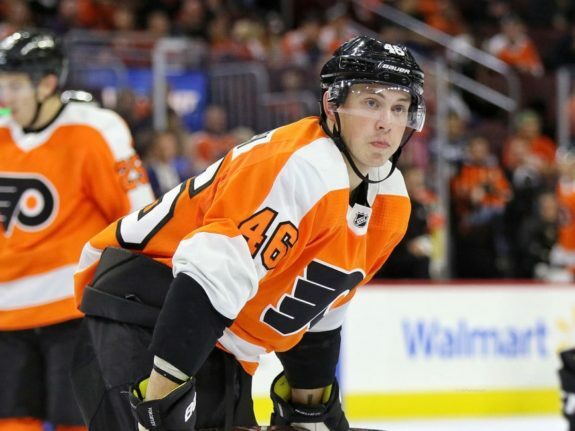 The coaches could use Mikhail Vorobyev over Jori Lehtera and put Claude Giroux on the ice to win key face-offs in the defensive zone if Sean Couturier just came off the ice. Vorobyev is defensively sound and is a smart two-way forward even though this will be his rookie season. Corban Knight is also an option should the team decide to keep him on the roster once he returns from an injury suffered during the preseason. The Flyers need to be more aggressive in the neutral zone and pressure the puck carrier, forcing him to make bad decisions. They can’t let the opposition have an easy exit or access to the offensive zone. Another aggressive move would be to stand up at the blue line without backing into the defensive zone when the other team is attacking. The Flyers shouldn’t be overly aggressive and start running around on the penalty kill to make a play, but they do need to start moving and not standing still, falling back into the box, which happens on almost every penalty kill. They should also try to cover the man in front, maybe get a body or stick on him to disrupt him and let the goalie see the puck. The only way for the Flyers to go is up. The four previous seasons have been a struggle but I think this season they will make the necessary changes and finish better than most fans expect. I have them finishing in the middle of the pack this year, killing about 81% of their penalties. It will be a huge improvement over previous seasons and they will need a big contribution from the penalty kill to get where they want to go.